The distal phalanx of the thumb is reconstructed mainly with a wrap-around flap. However, this approach tends to cause the loss of the distal phalanx of the toe. In this study, the methods for reconstructing the distal phalanx of the thumb using a wrap-around flap from the great toe and a tibial flap from the second toe were analysed retrospectively. The clinical efficiency of this method was also investigated. Free wrap-around flap creation, tibial flap creation from the second toe, and iliac bone graft repair were performed on 12 patients with loss of the distal phalanx of the thumb. Conversely, a free wrap-around flap from the big toe of the same side and a tibial flap from the second toe were created to repair the degloving injury of the thumb of another eight patients. Thus, the study included a total of 20 patients. All 20 skin flaps successfully survived after 6-60 months. The patients were satisfied with the appearance of their thumb. They also reported being able to use their repaired thumbs to grasp, nip, and pick up needles. The donor sites did not show scars, contractures, or ulcerations. No toe deformity was reported, and the foot activity was not affected. The application of a wrap-around flap and a tibial flap from the second toe in the reconstruction of the distal phalanx of the thumb effectively restores the appearance and function of the thumb. Thumb, Trauma, Surgical flaps, Transplantation. The thumb is used in virtually all activities that involve the arm and hand . Daily tasks, such as pinching, gripping, grasping, and precision handling, are more easily accomplished with an opposable thumb, and the thumb function accounts for 40% of the function of the entire hand . A thumb defect can lead to profound functional disability and psychological stress . Thus, traumatic thumb injury presents a much more significant influence on daily living than injuries to the other digits . Therefore, every effort should be made to reconstruct a functional thumb to regain hand function. With the development of microsurgery, the reconstruction of the thumb by means of toe-to-hand transfer has become increasingly popular [5-7]. This method is clearly no longer controversial [8,9]. However, thumb reconstruction via toe-to-hand transfer also has limitations [5,10]. The reconstructed thumb is short, and its pulp is bulky, in addition to the loss of the toe [11,12]. Although shaping surgeries on reconstructed fingers have been performed successfully [6,7], the defects from short nails and the loss of the toe cannot be overcome. For patients undergoing thumb reconstruction via second toe-to- hand transfer, the appearance of their original thumbs is difficult to replicate with their second toes. To avoid sacrificing the toe, the iliac bone was used to restore the length of the thumb with a degloving injury. A wrap-around flap creation is the preferred repair method for degloving injuries of the thumb ; however, it has certain disadvantages, including difficult skin grafting in the donor site, metatarsal pain after skin grafting, and sacrificing the big toe nail. Some surgeons proposed improved methods for designing wrap-around flaps . For example, a trough shaped flap from the left side of the tibia was used to alleviate metatarsal pain after skin grafting surgery. This method has certain advantages but is not always an effective solution for the loss of the distal phalanx of the big toe. Thus, the clinical application of wrap-around flaps is limited. For hand surgeons, restoring the normal appearance of the thumb while preventing the sacrifice of the big toe is a challenge. The Ruihua Affiliated Hospital of Soochow University used a free wrap-around flap and tibial flap from the second toe to repair 20 thumbs of 20 patients who lost the distal phalanx of their thumb. As reported below, satisfactory outcomes were achieved. The participants comprised 13 male patients and seven female patients aged 13-45 y (average age, 28 y). The causes of injury were as follows: crushing injury in six cases, wheel runover injury in five cases, electric planer injury in four cases, machine injury in two cases, stamping injury in two cases, and another injury in one case. Concerning the level of injury, 12 patients lost the distal phalanx of their thumb (at the nail root in eight patients and at the interphalangeal joint in four patients). The other eight patients had a degloving injury of the distal phalanx of the thumb, with intact distal phalanx, flexion tendon, and extensor tendon. The area of the proximal thumb wound ranged from 1.6 cm × 1.4 cm to 3.5 cm × 2.5 cm. The designed cutting area of the wrap-around flap was approximately 2.5 cm × 2.0 cm to 4.0 cm × 3.0 cm. The cutting area of the tibial flap from the second toe was 3.0 cm × 2.0 cm to 4.0 cm × 3.0 cm. Exactly 10 patients underwent selective operation after emergency operation, and the other 10 underwent emergency first-stage repair. The duration between the injury and the repair operation including both emergency operation and first-stage repair was 3.0-6.5 h (average duration, 4.0 h) (Table 1). Table 1. The information of the patient. The patients were placed in the supine position and were administered epidural anesthesia combined with brachial plexus anesthesia. For each patient, a thorough debridement was performed on the receptor site. The broken end of the phalanx was filed; the intrinsic arteries, nerves, and dorsal veins of the thumb were marked; and the length of the injured phalanx was accurately measured. The residual end of the thumb was incised transversely to identify the broken end of the nerve of the blood vessel and marked it for later use. For the patients who lost their distal phalanx, the bone was obtained from the iliac crest conventionally. The length of the iliac bone in this group was 1.5-3.5 cm (mean length, 2.0 cm). The iliac bone was trimmed to resemble the shape of the distal phalanx. The length and thickness of the bone were considered. A cross Kirschner wire fixation was performed at the proximal end of the thumb. A longitudinal Kirschner wire was maintained to be 0.5 cm longer than the bone. Joint fusion was conducted on the patients with damaged joints. For each patient, the first dorsal metatarsal artery (or the common plantar digital artery) was designed to serve as the wrap-around flap in the same vascular pedicle and the tibial flap from the second toe. The wrap-around flap was used to repair the dorsal nail bed of the thumb and the toenail, and the tibial flap from the second toe was used to repair the thumb pulp or palm. The dorsal nail bed and skin defect area in the distal phalanx of the thumb were used as the basis in designing the wrap-around flap. The area of the palmar skin defect was used as the basis in designing the tibial flap from the second toe. The wrap-around flap was designed to be slightly toward the fibula, which can include the intrinsic artery. The dorsal vein of the toe at the nail root was very fine and was thus difficult to incise. Before the operation, the flap was designed to have a trough shape, which allows cutting the vein and prevents the compression of the vascular pedicle. In the design of the tibial flap from the second toe, the lateral margin of the skin flap did not go beyond the metatarsal midline. The proximal end of the flap could carry a triangular flap to avoid compression during pedicle suture. For each patient, an S-shape incision in the proximal end of the flap was created between metatarsal bones 1 and 2 based on the designed line of the skin flap. The skin was opened to separate the vein into two flaps and ligate it without consideration of the branches. If the vein that was separated into two flaps had no traffic branch, the vein could be cut deeply up to the proximal area. The fibular intrinsic artery of the big toe, tibial intrinsic artery from the second toe, and nerve and common plantar digital artery (or the dorsal metatarsal artery) were separated from the toe web. The skin flap was then obtained from the superficial layer of the deep fascia and was properly enlarged. During the operation, care was taken to avoid damaging the veins and nerves. Because the nail bed was fixed on the phalanx firmly, the periosteum needed to be separated from the nail bed to ensure the survival of the transplanted skin. For each patient, the required length of the vascular pedicle was used as the basis in breaking the pedicle. The wrap-around flap covered the dorsal wound of the thumb. The thumb was fixed to the skin of the toe using the Kirschner wire. The tibial flap from the second toe covered the palmar wound of the thumb, which was fixed using a few interrupted sutures. The vascular pedicle coincided with the proximal vessel through the tunnel. The common plantar digital artery (or the first dorsal metatarsal artery) was used to coincide with the superficial branch of the radial artery snuffbox. The nerve of the skin flap coincided with the bilateral nerve. The dorsal vein of the hand coincided with the toe vein. After ensuring that the skin flap had sufficient blood supply, the skin was sutured. If the tension of the skin suture was high, free skin grafting was performed instead of a skin suture. Full-thickness skin grafting from the belly (iliac bone region) and compressed wrapping were adopted for the donor site. The belly wound was then gradually sutured. Dipyridamole (25 mg three times daily for 5 d), acetylsalicylic acid (25 mg three times daily for 5 d), anisodamine (10 mg once a day for 3 d), and papaverine (30 mg four times daily for 7 d) were administered to the patients. Antibiotics were administered for 1 w. After 2 w, the plaster external fixation was removed. Functional exercises were recommended in accordance with rehabilitation medicine practices. For the 12 cases of distal phalanx defect, the wounds healed after the first-stage repair; the transplanted tissues survived well; and the grafted skin in the donor site smoothly healed. The follow-up period was 6-60 months (average, 18 months). The phalangette showed good bone healing after 2-5 months (average, 3.5 months). Nonunion of the bone or re-fracture was observed in the follow-up period. The appearance of the repaired thumb was satisfactory according to the criteria issued by the Hand Surgery Society of Chinese Medical Association for the functional assessment of reconstructed thumbs and fingers. Moreover, the nail grew well with adequate toughness. The repaired thumb effectively assisted in the grasping, nipping, and picking up of needles. For each of the eight cases that maintained the interphalangeal joint, the interphalangeal joint of the thumb could bend up to 40º-90º (average angle, 55º). For the four cases involving interphalangeal joint fusion, the distal phalanx had poor function, whereas the metacarpophalangeal joint had normal function. A total of 12 patients reported thumb opposing function. Patients who received skin transplantation from the foot reported that the skin in the transplant site was loose. No obvious effect on walking function was reported. The eight patients with a degloving injury of the thumb reported the survival of the transplanted flaps and the healing of their wounds after the first-stage repair. The grafted skin in the donor site of the foot smoothly healed. The postoperative follow-up period spanned 6-18 months (average, 8 months). The skin flap was similar to the normal thumb in terms of color and did not exhibit obvious atrophy and pigmentation. The appearance of the thumb was satisfactory. The nail also grew well. The sensation of the thumb pulp recovered to S2-S3+. The interphalangeal joint of the thumb could perform flexion and extension activities well. The donor site did not show scars, contractures, or ulcerations. Moreover, toe deformity was not observed, and the foot activity was not affected. The wound in the belly also effectively healed after the first-stage repair. A 13 y old female patient was admitted 6 months after an operation for left thumb trauma. Physical examination on admission showed the loss of a significant part of the distal phalanx of the left thumb. Only a small part of the nail root, which showed onychogryphosis, was left (Figure 1A). The trauma was found to have a significant psychological influence on the patient. The parents of the patient requested for a reconstruction procedure. The patient was admitted, and surgical contraindications were ruled out. The operation included free iliac bone grafting, wrap-around flap creation in the same vascular pedicle, tibial flap creation from the second toe for repairing the distal phalanx of the thumb (Figure 1B), and skin transplantation from the belly to the donor site. The operation was smoothly performed under epidural anesthesia combined with brachial plexus anesthesia. Three conventional drugs were administered, and symptomatic treatment was provided after the operation. Two weeks after the operation, the skin flap and transplanted skin healed effectively after the first-stage repair. The patient was then discharged from the hospital. At the 3 y follow-up, the skin flap was found to have good quality and appearance. The 2-PD of the reconstructed thumb was 4 mm. The grasp strength and pinch strength were close to those of the normal thumb (Table 1). The interphalangeal joint could move at an angle of 0º-60º (Figure 1C). The nail also grew well (Figure 1D). The transplanted bone healed well without affecting the activities of the donor site of the foot. Figure 1. A 13 y old female patient with a loss of the distal phalanx of the left thumb. Free iliac bone grafting, wrap-around flap and tibial flap from the second toe were used to repair the distal phalanx of the thumb A. Partial loss of the distal phalanx of the left thumb. B. Design of the skin flap in the left foot. C. Activities of the interphalangeal joint of the thumb three years after the operation. D. Comparison of the interphalangeal joint of the thumb and the healthy thumb three years after the operation. A 42 y old female patient was admitted to the hospital for 2 h because of a degloving injury of the distal phalanx of the left thumb (Figure 2A). With the patient under epidural anesthesia combined with brachial plexus anesthesia, a free wrap-around flap from the left big toe, combined with the tibial flap from the second toe, was used to repair the left thumb. The donor site in the dorsal nail flap of the left thumb was transferred to repair the tibial flap from the second toe (Figure 2B). After the operation, the combined flap of the thumb survived; the wound healed well; and the transplanted skin and flap in the donor site of the feet survived. Two months after the operation, the skin flap healed well and showed good appearance. The thumb function was also restored. The transplanted skin in the donor site of the feet did not show scars, contractures, or ulcerations. Foot activity was not affected. At the 6 month follow-up, the skin flap was found to be similar to the normal thumb in terms of quality, color, and thickness. It also showed a satisfactory appearance after the repair. Rib formation was also observed on the pulp. In addition to its satisfactory appearance, the thumb could aid in the nipping and holding of objects. Sensation also recovered to S3+, and the 2-PD was 8 mm (Figure 2C). The grasp strength and pinch strength were close to those of the normal thumb (Table 1). The transplanted skin at the donor sites survived with no scars, contractures, or ulcerations. The feet activity were not affected (Figure 2D). Figure 2. A 42 y old female patient with a degloving injury of the distal phalanx of the left thumb. A free wrap-around flap from the left big toe, combined with the tibial flap from the second toe, was used to repair the left thumb A. Preoperative defect. B. Design of donor site of the foot. C. Sixth month follow-up after the operation. D. Donor site in the sixth-month follow-up after the operation. 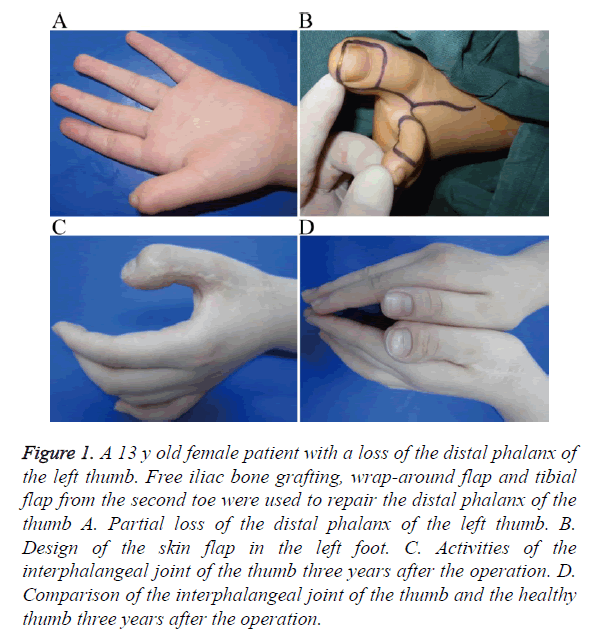 Various methods are used to reconstruct the distal phalanx of the thumb clinically. Such methods include stump revision, skin flap transplantation , and reconstruction with the free toe [8,16,17]. According to the evaluation criteria of hand function, the loss of the thumb equates to the loss of 40% of hand function , and the loss of the distal phalanx of the thumb equates to the loss of 10% of hand function. The loss of the distal phalanx of the thumb causes poor nail appearance and particularly affects the pinching function of the thumb relative to the other four thumbs, as well as its ability to aid in the picking up of small objects [1,18]. Therefore, the loss of the distal phalanx of the thumb should be treated via reconstruction as much as possible. Reconstruction with the free toe can recover the length of the thumb and restore the thumb function via exercises . However, the reconstructed thumb may present some disadvantages, including a narrow neck, limited extension function, and reduced size . The appearance of the thumb is improved via various reversion and prosthesis operations [21-23]; however, the shortness of the nail, loss of the toe, and other disadvantages cannot be overcome. The distal phalanx of the thumb is divided into three parts: (i) the dorsal nail bed and soft tissue of the skin, (ii) phalangette and adhered tendon tissue, (iii) and soft tissue of the palmar skin. Following the principle of microsurgery (i.e., filling what is missing) [17,24], we adopted a wrap-around flap from the great toe and a tibial flap from the second toe, combined with a bone graft from the iliac crest to perform reversion for the three parts, and obtained a satisfactory outcome. For the degloving injury of the distal phalanx of the thumb, many reversion methods feature different effects. At present, the common methods include pedicle tube, pedicle flap, free flap, and fascial flap creation. However, these methods can only address skin defects, that is, they cannot repair the loss of the thumb pulp, nail, and nerve . The conventional wrap-around flap is employed for degloving injuries of the distal phalanx of the thumb. With this method, the appearance of the repaired thumb is excellent, and sensation is successfully recovered. Moreover, the method provides the most accurate clinical effect . However, the distal phalanx is always cut during incision of the conventional wrap-around flap. This cut results in the loss of the distal phalanx of the big toe. Hence, patients do not easily accept the poor appearance and function of the big toe . With the development of microsurgery and microvascular anastomosis, the available repair methods have become increasingly complicated and meticulous. The methods are becoming more miniature, accurate, diverse, and complex . Therefore, in this study, we addressed the degloving injury of the distal phalanx of the thumb using the free wrap-around flap and tibial flap from the second toe. In performing the repair operation for the degloving injury of the distal phalanx of the thumb without sacrificing the toe, the approach maintained the advantages of the repair with a conventional wrap-around flap and reduced the damage to the donor site. The wrap-around flap from the great toe and tibial flap from the second toe are related to the first dorsal metatarsal artery and nerve as the physiological skin flap of the pedicle. The quality, color, and thickness of the flap are close to those of the normal thumb. The nail carrying the sensory nerve can be freely cut. The positions of the plantar digital artery and the nerve anatomy are constant. They are the ideal flaps for repairing thumb wounds [25-29]. The digital artery nerves in the target site can provide the functions of the artery and nerve required by the two flaps. Therefore, adopting the combined flap repair method is feasible. Two feet are used to provide the combined flap, as this can maximally reduce the damage to the donor site and facilitate the reshaping of the combined flap, thereby ensuring the convenient anastomosis of the blood vessels . With the loss of the distal phalanx of the thumb and the possibility of damage to the interphalangeal joint, patients have high requirements with regard to hand function and nail appearance. Hence, they are unwilling to sacrifice the toe. The method offers the following advantages: satisfactory appearance of the repaired thumb; normal nail size that resembles that of a real thumb nail ; good nail growth; successful recovery of sensation; absence of deformity; improved ability of the thumb to assist the thumb pulp in grasping, nipping, and picking up objects; improved ability of the transplanted iliac bone and phalanx to reach the healing bone; avoidance of nonunion of the bone and bone resorption; minimal damage to the donor site; prevention of the loss of the toe; absence of effects on the foot load and function; and absence of painful scars. Conversely, the disadvantages are as follows: high microsurgery requirements for the operator, need for joint fusion surgery for patients with damaged interphalangeal joints, nonmovement of the interphalangeal joint after the operation, and required removal of the nail bed of the toe in the donor site. During flap incision, the incision of the vein must be considered. If necessary, the operation can be performed under a microscope. For patients with nail bed defects, a small triangular flap should be cut out from the side of the toe during flap incision. This step facilitates the incision of the vein and prevents the compression of the swollen vascular pedicle after the operation . In the incision of the wrap-around flap, a small quantity of the toe pulp skin must be allotted for the fixture. Moreover, the nail bed of the big toe should adhere to the phalanx. Hence, a sharp separation must be carefully performed along the periosteum to prevent any damage to the periosteum, which could affect the survival of the transplanted skin. The skin of the flap must not be sutured reluctantly if the tension is too high to prevent pedicle compression, as this could affect the blood supply of the skin flap. A small portion of the wound can be covered with the transplanted skin. Smutz WP, Kongsayreepong A, Hughes RE, Niebur G, Cooney WP. Mechanical advantage of the thumb muscles. J Biomech 1998; 31: 565-570. Ray EC, Sherman R, Stevanovic M. Immediate reconstruction of a nonreplantable thumb amputation by great toe transfer. Plast Reconstr Surg 2009; 123: 259-267. Su R, Mei X, Gu Y. Thumb reconstruction by second toe transfer and dorsalis pedis flap, with the use of a peroneal perforator flap to replace the skin deficit on the foot. J Hand Surg Eur Vol 2013; 38: 435-437. Lai CH, Lai CS, Huang SH, Lin SD, Chang KP. Free medial plantar artery perforator flaps for resurfacing of thumb defects. Ann Plast Surg 2010; 65: 535-540. Woo SH, Kim JS, Seul JH. Immediate toe-to-hand transfer in acute hand injuries: overall results, compared with results for elective cases. Plast Reconstr Surg 2004; 113: 882-892. Wei FC, el-Gammal TA, Chen HC, Chuang DC, Chiang YC, Chen SH. Toe-to-hand transfer for traumatic digital amputations in children and adolescents. Plast Reconstr Surg 1997; 100: 605-609. Coskunfirat OK, Wei FC, Lin CH, Chen HC, Lin YT. Simultaneous double second toe transfer for reconstruction of adjacent fingers. Plast Reconstr Surg 2005; 115: 1064-1069. Tuncer S, Sezgin B, Kucuker I, Kaya B, Ayhan S. Reconstruction of the left thumb with a second toe transfer in a musicians hand. J Plast Surg Hand Surg 2014; 48: 444-448. Lam WL, Wei FC. Toe-to-hand transplantation. Clin Plast Surg 2011; 38: 551-559. Williamson JS, Manktelow RT, Kelly L, Marcuzzi A, Mahabir RC. Toe-to-finger transfer for post-traumatic reconstruction of the fingerless hand. Can J Surg 2001; 44: 275-283. Kotkansalo T, Vilkki S, Elo P. Long-term results of finger reconstruction with microvascular toe transfers after trauma. J Plast Reconstr Aesthet Surg 2011; 64: 1291-1299. Lin PY, Sebastin SJ, Ono S, Bellfi LT, Chang KW, Chung KC. A systematic review of outcomes of toe-to-thumb transfers for isolated traumatic thumb amputation. Hand (N Y) 2011; 6: 235-243. Lee KS, Park JW, Chung WK. Thumb reconstruction with a wrap-around free flap according to the level of amputation. Microsurgery 2000; 20: 25-31. Galeano M, Checcucci G, Ceruso M. Reconstruction of the thumb with a modified wrap-around flap in a patient suffering from β-thalassemia minor. Hand Surg 2011; 16: 361-365. Mutaf M, Temel M, Günal E, Isik D. Island volar advancement flap for reconstruction of thumb defects. Ann Plast Surg 2012; 68: 153-157. Lin CH. Toe-to-thumb reconstruction. Injury 2013; 44: 361-365. Lin CH, Lo S, Lin CH, Lin YT. Opponensplasty provides predictable opposable tripod pinch in toe transfer for proximal thumb ray defect reconstruction. Plast Reconstr Surg 2012; 130: 810-818. Yan H, Persons B, Gao W, Angel MF, Zhang F. Nail flaps for microsurgical aesthetic reconstruction of thumb and donor site of great toe. J Plast Surg Hand Surg 2012; 46: 212-214. Sabapathy SR, Venkatramani H, Bhardwaj P. Reconstruction of the thumb amputation at the carpometacarpal joint level by groin flap and second toe transfer. Injury 2013; 44: 370-375. Zhao J, Tien HY, Abdullah S, Zhang Z. Aesthetic refinements in second toe-to-thumb transfer surgery. Plast Reconstr Surg 2010; 126: 2052-2059. Woo SH, Lee GJ, Kim KC, Ha SH, Kim JS. Cosmetic reconstruction of distal finger absence with partial second toe transfer. J Plast Reconstr Aesthet Surg 2006; 59: 317-320. Tang HP, Fang GR, Teng GD. Revisional surgery for improving outward appearance of reconstructed digit in toe-to-hand transfer. Chin J Microsurg 2008; 31: 178-180. Ju JH, Hou RX. One-stage cosmetic finger reconstruction using a second toe island flap containing terminal branches of the toe artery. Orthop Traumatol Surg Res 2015; 101: 345-351. Muyldermans T, Hierner R. First dorsal metacarpal artery flap for thumb reconstruction: a retrospective clinical study. Strategies Trauma Limb Reconstr 2009; 4: 27-33. Rui Y, Mi J, Shi H, Zhang Z, Yan H. Free great toe wrap-around flap combined with second toe medial flap for reconstruction of completely degloved fingers. Microsurgery 2010; 30: 449-456. Ki SH, Hwang K, Kim DH, Hwang S, Han SH. A toenail flap based on the fibro-osseous hiatus branch for fingernail reconstruction. Microsurgery 2011; 31: 371-375. Zhang X, Chen C, Li Y, Shao X, Guo W, Sun J. Does nerve repair influence the outcome of reconstruction of a digital nail defect using a free composite flap taken from the great toe? J Hand Surg Eur 2015; 40: 583-590. Zhang G, Ju J, Zhao Q, Li X, Jin G, Tang L, Hou R. Combined ipsilateral and contralateral second toe flaps for repair of finger degloving injury. Microsurgery 2014; 34: 540-546. Yan H, Ouyang Y, Chi Z, Gao W, Zhang F. Digital pulp reconstruction with free neurovascular toe flaps. Aesthetic Plast Surg 2012; 36: 1186-1193.